The Hungarian Wax Pepper, a pod type of Capsicum annuum, is also known as the Yellow Wax Pepper, the Hot Hungarian Wax Pepper and the Hungarian Wax Chile Pepper. These peppers are often confused with the milder banana pepper or guero. It was sometime between 1538 and 1548 when Hungarians first began to use hot peppers in their cooking. 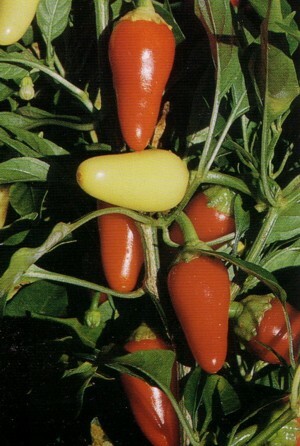 The Hungarian Wax varieties were developed from the milder Hungarian Banana pepper. The Wax pepper was introduced into the United States and Canada from Hungary in 1932. It is presently grown all over North America and grows well in cool climates. One of the first pungent varieties was ‘Hungarian Yellow Wax Hot’, which became a popular garden and pickling chile. Another variety, which was first used exclusively as an ornamental, is ‘Floral Gem’, with its beautiful orange-red pods. 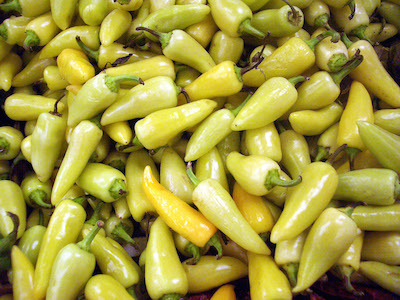 This variety is commercially pickled in the yellow stage as “Torrido” peppers. In 1966, Dr. Paul Smith of the University of California-Davis crossed Floral Gem with the Fresno variety of New Mexican chile, and then crossed that hybrid with ‘Hungarian Yellow Wax Hot’ to produce the ‘Caloro’ variety, which was soon refined to become ‘Santa Fe Grande’. 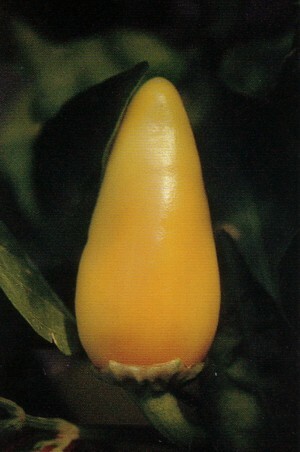 The most pungent variety of the Wax type is ‘Gold Spike’. 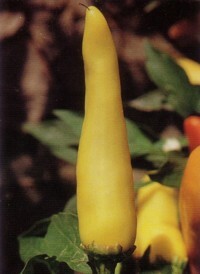 Long and tapering, the Hungarian Wax Pepper is a creamy yellow color with a waxy translucent finish. It has a thin skin and a thick flesh. It matures to a striking red-orange to red color. The pods can grow to 5 to 8 inches. This pod type probably has the widest heat range of any chile. It requires a taste test in order to judge its piquancy as it can vary from warm to moderately hot. Fully ripe, the Scoville Heat Units can vary from 100 to 15,000. The Wax type varies in size, appearance, and pungency. The ‘Santa Fe Grande’ variety has multiple stems and a compact habit, growing 30 inches high or more. The leaves are ovate, smooth, medium green in color and measure 5 inches long and 3 inches wide. The flower corollas are white with no spots. The pods are borne erect to pendant (depending on size), are conical but tapering, and bluntly pointed at the end. They begin as yellow and mature to orange and then red, and measure 3 1/2 to 5 inches long and 1 1/2 inches wide. The growing period is 70 or more days, and the yield is 25 or more pods to the plant. The wax pepper is considered a self-pollinating plant. Although it is grown as an annual crop (due to its sensitivity to frost), it is actually an herbaceous perennial. The ideal temperatures for pepper growth range from 75 to 89 degrees F. during the day and 65-75 degrees F at night. Hungarian Wax Peppers are harvested at two different stages of maturity. Half of the crop is picked as they ripen from a lime green to a yellow green color. At this stage they have very little heat. The remaining fruits are left until they become a red-orange color with a natural almost beeswax sheen (for this reason the name ‘wax pepper’). The fresh flavor remains intact while the fruit’s maturity has pushed it up the heat scale. Days to maturity from planted seedlings: 59 days for green/yellow and 84 days for red. To harvest, clip the pepper stem, leaving at least an inch with the pepper if you intend on drying them. Most greenhouse peppers in Ontario, Canada, including the Hungarian Wax Pepper, are produced using hydroponic systems. The majority of them are grown in rockwool (an inert growing medium with excellent water-holding capacity) with some in foam, coconut fiber and NFT (nutrient film technique). The improved ability to manage plant growth and adjust nutrients results in producing better quality crops with reduced energy for a longer harvest period. Bumble bees are used in some of the pepper greenhouses to improve fruit quality. About 3,000 acres of Wax chiles are commercially cultivated in the United States, principally to produce pickled peppers. They are popular home garden varieties because of their hardiness and the beautiful colors of yellow, orange, and red fruits on the same plant. In Canada, 3750 acres of peppers are grown annually and 82% are sweet. Although Hungarian wax peppers are medium-hot, you may want to wear gloves when working with them and usually the seeds are discarded before using the peppers in a dish. Wax peppers cook well and often will add just the right amount of heat to a dish so that it doesn’t over power other flavors. You can use them fresh both at the yellow or red stages. They can be stored in the fridge wrapped in paper towel, a brown bag, or zip-locked in plastic. When drying the mature red pods make sure there are no soft spots, string them by their stems and hang them in a dim dry place with good air circulation. Wax peppers can be chopped and frozen to add them later to cooked sauces such as spaghetti. They are tasty in salsas or salads or raw stuffed with cream cheese. Wax chiles are good substitutes for jalapeños. Hungarian wax peppers are good in sandwiches, raw relish platters, and dips. They can be filled with cheese or a meat mixture and then sautéed. They add a colorful and piquant flavor to bean and grain dishes. They are delicious fried and good with scrambled eggs and potatoes. Thin slivers can be tossed into hot or chilled puree soup like gazpacho. They are delicious when added to chutneys and pepper jelly. Most people simply pickle them. Folklore has it that Hungarians believe a woman’s passion is measured by her capability to eat fiery hot food.